What is a Systematically Engineered Intelligent Planet ? 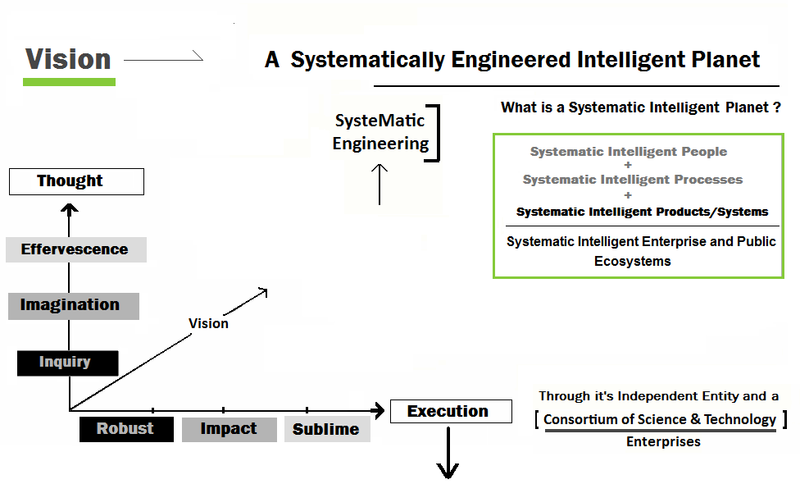 In Simple words Systematically Engineered Intelligent Planet means building Systematic Intelligent [ People, Processes, Products/Systems & Services ]. A Systematically Engineered world, is a world where - There is a degree of certainty and balance in the world ecosystem, and outcomes in Business and Industry are more predictable. We have all studied probability and Chance in Maths, however most processes in todays world are associated with a degree of uncertainty and randomness (chaos - Entropy( Disorder )).It could be in simple things like finding a job, finding relevant accurate information or even making sound Financial Investments with predictable yet rich returns ( not like the stock market! ). T&C Vectors Systematically Engineered Intelligent Planet Solutions embodies an Architectural Approach to building and governing Ecosystems ( Enterprise and Public Communities ). T&C Vectors has created a new Systems science called Super Fractal Engineering, that solves a variety of Heterogeous problem domains and brings in the elements of predictability and certainty in the functioning of Industry and Societal ecosystems. Machine systems are engineered for purpose and Performance, and similarly we may be able to engineer people, processes, Enterprise systems, Public ecosystems for predictability and performance at Scale. Vision Cycle for a Systematically Engineered Intelligent Planet. What are the Basic steps to Building a Systematically Engineered Intelligent Planet, from T&C Vectors Design Bureau's perspective ? Envision to create a Smarter Systematically Engineered Planet. Research and develop the new Super Science called Super Fractal Engineering. Innovate and create fundamentally new knowledge and techniques. Smarter People with Smarter Thinking, Knowledge and Skills. Creation of "Systematically Engineered Innovative &Intelligent" Enterprises. Creation of Wealth &Systematic Value. Note:Creating Wealth by creating smarter systems is called creating "Systematic value". This Value creation may not be confused with the general Business terminology of creating value - where any form of demand generation is also termed as creating value. for e.g Tabloids too create demand, but not necessarily Systematic Value. Creation of a Large number of Smarter Modern Jobs. that it further enables multi disciplinary Enterprises to "Systematically Innovate" further. Research and Develop the Concept of "Community Mutual Funds". Collaborate with Financial Institutions to administer this next generation Investment Instrument. Utilise the Wealth created from the digital Products portfolio along with Community Mutual Funds to create well developed Infrastructure and Industrial Systems and Utilities(Rail, Road, Healthcare, Electric Energy, Digital Infrastructure,etc..)to allow a good standard of living for people and Societies the world over. Creation of Developed infrastructure in Developed and the Emerging world. This is also called Nation Building. Creation a Large number of Jobs and therefore new sustenable ecosystems. Distribution of wealth between Enterprises and people.